Endurance Riding is one of the fastest growing equine sports. Certain breeds have been prized for their great endurance for thousands of years. But what makes this growing sport so exciting? The popularity of endurance riding in North America doesn’t come close to it’s popularity overseas. Arabians are by far the most world renowned horse for it’s great endurance. Because of their small stature the more famous Thoroughbred and Quarter Horses can easily out run them in the shorter distances, but Arabian Horses are prized for their genetic predisposition to fantastic feats of endurance. These horses are very well known for their spirited nature and high strung attitude. Their typically small stature may work against them in the traditional flat race where they do not have the great stride of the Thoroughbred, but their nimbleness and agility are a great asset on unpredictable and sometimes treacherous trails. While any well trained and healthy horse can compete in these races, the intelligence of the Arabian horse makes it a favourite in the Endurance circuit. 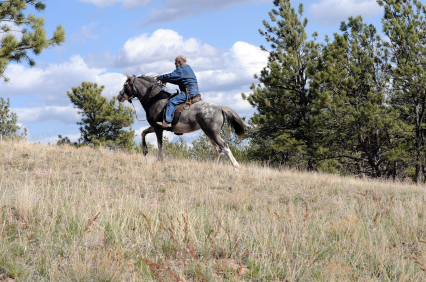 Endurance riding is a lifestyle for both the horse and rider, and months go into preparations for a race. Flat races are typically under 2 miles, and horses run all out from a standing start. Endurance races are much, much longer. The Tevis Cup held annually in California is 100 miles. While it is just amateur event, popularity of these races have been skyrocketing. With twitter and webcasts making it very easy to post instant updates not only at the rest stops but on the trail, this long-distance trek is becoming more and more spectator friendly. Endurances races can vary greatly. Some may be as short as ten miles and others well over 100 miles. Typically races over 100 miles are multiple day events. Races under 20 miles are considered pleasure rides. Then they increase in difficulty from non-competitive, competitive, and progressive trail rides. Endurance rides are races from 40 up to 150 miles, sometimes spanning days. These races are dirt races, a predetermined trail that is well marked and mapped for riders. Is this cruel to the horse? There are a number of required stops along the trail. These stops have a required vet check. This check ensures that the rider is not overworking the horse, and that the horse is healthy and handling the distance well. A horse that does not pass the vet check is disqualified from the race and is not allowed to continue. At these stops the rider will have a “pit crew”. Depending on the rules of the specific race, there is a minimum amount of time required of rest before the horse and rider are allowed to continue. In order to make the maximum use of this time the “pit crew” will help the rider care for the horse. Finishing the race first is the ultimate goal, however in the Endurance Riding racing structure there are protections to ensure that this is not done at the expense of the horse’s health. The Tevis Cup has been held annually in California since 1955. Every horse and rider team who completes the 100 mile journey is awarded a belt buckle. The Tevis Cup is given to the first place finisher, and the Haggin Cup is given to the horse who completes the race in the best condition. It is very rare that a horse and rider team will win both trophies. The Tom Quilty Gold Cup is Australia’s most famous 100 mile 1 day endurance race. This race is known for it’s long hilly sections that require strategy. This ride is world famous and many riders will even come in from overseas in hopes to gain a completion buckle. The Shahzada is the world’s longest ride. At nearly 250 miles, this 5 day event is yet another Australian Endurance Race. This race was named after a purebred Arabian horse imported to Australia and was known for his impressive long distance racing record. Legend has it that Shahzada completed this 250 mile race in just over 37 hours. With over 2000 local and international riders, this is the absolute peak of the marathon rider’s skill.